With this lightweight, travel-friendly micro-vibration wand, you can improve the efficacy of all your skin care products – and increase microcirculation at the same time! Designed to be used with any product, this magic wand is powered by ionic energy, automatically vibrating once moisture is sensed and stopping once your chosen formula is completely absorbed. Dramatically improving delivery, it allows anti-ageing actives and nutrients to penetrate deeper into the skin – by up to 30%. 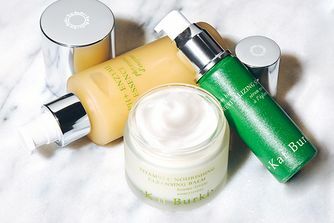 Tired of your skin care products not living up to expectations? Give Kat Burki’s magic Micro-Firming Wand a wave and you’ll improve them all. Powered by iontophoresis (tiny local electric currents) and micro-vibration, this beauty tool boosts micro-circulation while also improving the delivery of skin care products. Designed to be used at the same time as your favourite products, it automatically starts vibrating once moisture is sensed and stops once the product is completely absorbed, allowing active anti-ageing nutrients to penetrate deeper into the skin – by up to 30%. Lightweight and travel-friendly, it has no messy cords, just one battery and endless skin boosting. Wipe with damp/dry cloth or sanitise with alcohol wipes.